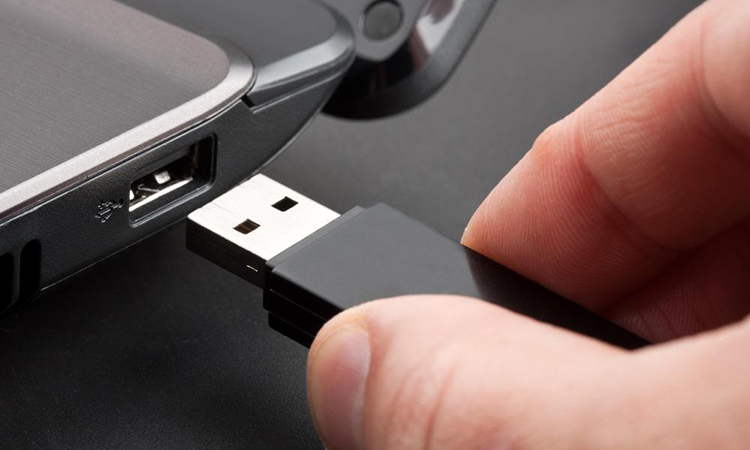 You probably have heard that it’s important to use the safe removal option before removing a USB device from your computer. It’s also very likely that you have unplugged USB sticks without going through this safe procedure. But chances are, your device worked perfectly fine although you didn’t use that option at times. Even Windows tells us that it’s not required to use the Safely Remove Hardware feature if we are using the default settings – but this advice from Windows is a bit misleading. Windows lets you optimize the USB device for either quick removal or better performance. If you have never touched these settings, Windows has it optimized for quick removal. You can change it by going to the device manager – open Start menu and type Device Manager, then press Enter to launch it. Click and Expand the Disk drives section in Device Manager, now right-click on your device name and select Properties. Select the Policies tab on the Properties window. There you will see windows suggesting that you can remove your USB device without clicking on ‘Safely remove hardware’ icon (Quick removal), so you would probably think that you can just unplug it, right? Not really. What Windows says above is actually a bit misleading. For instance, when you are moving files into the USB drive or saving a file, you could get the data corrupted by unplugging it. Regardless of the option you use, you must make sure that the USB device is not being used by the system before unplugging it. Many USB devices have indicator lights that blink when they are in use. Sometimes, the USB device could be in use although it appears to be idle. Some programs might be writing to it and unplugging can still end you up with corrupted data in the drive. If you are so sure that no data is being written to it, it’s moderately safe to unplug it without any fear of data corruption. However, It’s recommended that you still use the ‘safely remove hardware’ option before unplugging the device, Windows will ensure all the programs are done with your device and tell you when it’s safe to remove it. 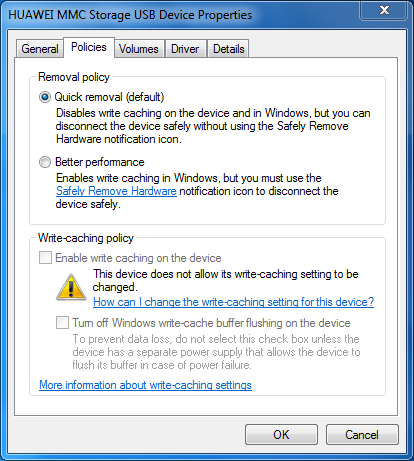 If you have selected the ‘Better Performance’ mode, Windows won’t write data to the USB drive immediately, instead it will cache the data (write caching). What this does is improve the performance of your USB device. Unplugging without ‘Safely remove hardware option’ is a big NO when Better Performance mode is selected. With the write caching enabled, the data might appear to have been written to the USB drive and the file moving/copying progress dialogs seem to have completed, yet the data could just be cached on your system. When you use the Eject/Safely Remove Hardware option, windows will flush all the cached data into the USB drive and make sure everything is complete before notifying you that it’s safe to remove your device. 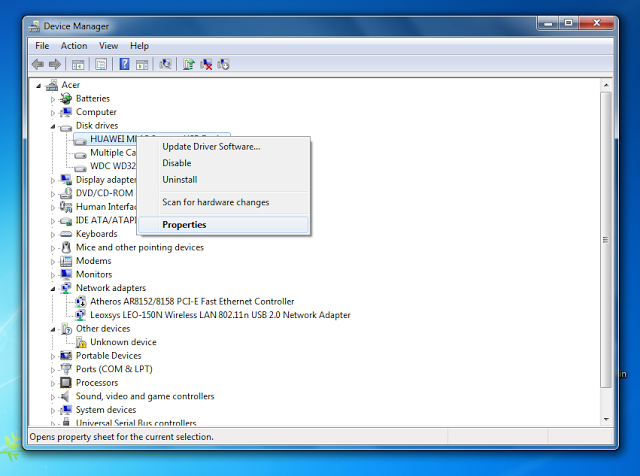 Although the Quick Removal option doesn’t favor USB performance, it is set as the default option in windows to minimize the risk of data corruption. 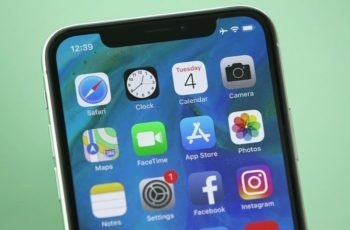 Many people just forget to use and some never use the ‘Safely Remove Hardware’ feature before pulling out a USB device from their computers. No matter what option you select, it is always recommended to use the Safely Remove Hardware option before unplugging a USB device from your system. 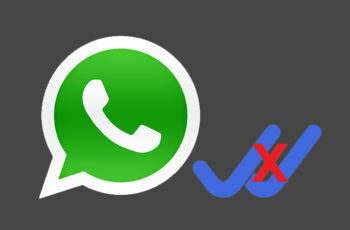 This will help windows eliminate any chances of data corruption and you can unplug your device without worries. If you are disposing or selling your gadgets like USB storage devices, it is a good idea to securely wipe those devices to protect your data.